Today we are continuing to get plants ready for the European Orchid Congress in Paris and it looks as if this species might be one that books a spot in the van. 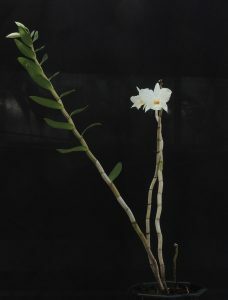 This large flowered dramatic Dendrobium is native to the Eastern Himalayas from Assam through China, Thailand, Laos and Vietnam. We find it does best grown warm (we give it a minimum of 16C) where it seems to flower well without a marked rest period. 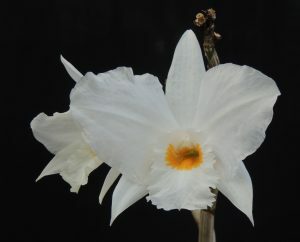 The long pseudobulbs are particularly attractive with their covering of dark hairs. On our expeditions to Laos we have found its habitat in evergreen forest with hot wet summers and dryer cooler winters although dew is significant in the dry season leaving the forest damp every morning. The species flowers several times each year and the individual flowers, although looking papery, last for two months. Our plant is still young but has flowers and buds on three years of growth and with a bit of luck will be flowering of two of them by Paris. As you can see each year’s growth is considerably longer than the previous year and this will form a really magnificent plant in years to come. What a beautiful flower for Mothers Day.